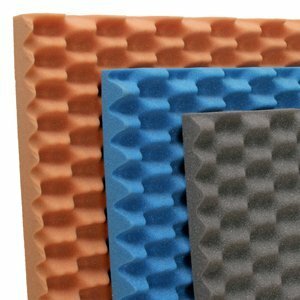 The right studio foam soundproofing can make the difference between a good recording and a great one. Soundproof Cow understands this concept, which is why we offer all different types of sound dampening insulation solutions for different studio foam applications. 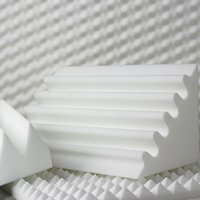 We carry multiple styles and sizes of studio foam from top brands like Udderly Quiet™. 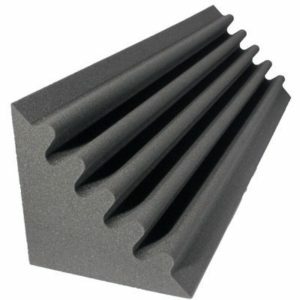 Most commonly associated with soundproofing a recording studio, soundproof studio foam is designed to absorb sound and improve the acoustics of any space, no matter if it’s a studio or your house. 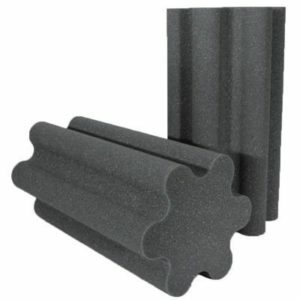 Studio Foam is perfect for: Recording studios, broadcast studios, theaters auditoriums, band rooms, gymnasiums, homes, offices, conference rooms and equipment rooms. 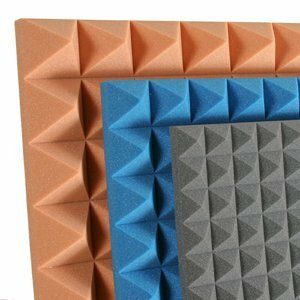 If you’re looking for soundproof foam that’s a little more low-profile, be sure to check out our Acoustic Foam section for fabric-wrapped foam, foam panels and fire-rated foam panels. 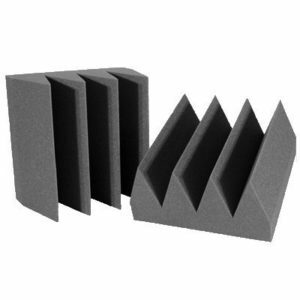 Sound proofing studio foam improves sound clarity in an enclosed area by reducing the reverberation of sound waves. Although it won’t stop all sound, sound insulating foam is one of the most effective and affordable methods for minimizing reverberation, echo and other noise debris. When unwanted sound clutter is interfering with the ability to record music, hear music and listen to lectures and conversations without everyone constantly asking, “What did he just say?”, you definitely need our noise canceling foam. 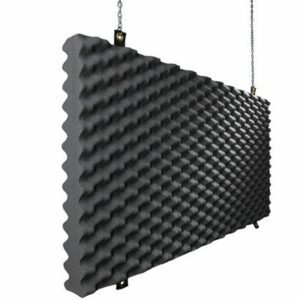 Acoustic foam panels work by diminishing the intensity of sound waves through absorption. Once sound waves become airborne, they’ll keep moving like a tidal wave until they finally expend their energy. In fact, you can imagine how sound works by picturing thousands of tennis balls bouncing around a room. The Acoustic foam acts like a Velcro® trapping the balls or “sound waves” that contact the foam. 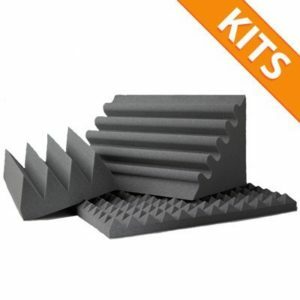 Without soundproofing studio foam taking the brunt of noisy sound waves, you’ll hear unwanted stuff like echoes, “fuzz” and clutter you don’t want ruining special events or recording gigs. We used to live in a quiet world, but all that changed over a century ago. In fact, nobody bothered to measure noise levels until someone discovered that loud noises permanently damage your ability to hear. Fortunately, we can measure sound in decibels to determine whether it presents a health hazard. When you listen to a whisper, you are exposing your eardrum to 30 decibels, or dB. That’s not bad at all. Listening to a normal conversation exposes you to 60 dB. If someone shouts at you while standing about three feet away from your ears, you’re listening to 90 db (or more, if they’re really angry or excited). Power tools and lawn mowers present noise levels approaching 100 to 120 dB. Shotguns? 165 dB. A rocket launching? 180 dB. Irreversible damage to hearing may occur when sounds reach 140 dB. Sounds over 85 dB are known to reduce hearing abilities over time (that’s the decibel level of someone yelling at you). Airborne sounds are air pressure waves that, when reaching the amount of the existing air pressure, converts to a shock wave. Since normal air pressure (sea level air pressure) is about 14 pounds PSI, this equals 194 dB. This means the loudest possible sound exhibits 194 dB at sea level. Anything beyond that is a shock wave — and shock waves can ruin your hearing permanently. Listening to high-decibel noises affects people physically and psychologically. Tinnitus, noise-induced hearing loss, cognitive problems and even mood changes have been attributed to noise. Human ears weren’t meant to be exposed to sustained loud noises several hours each day. Instead, our ears developed to detect naturally occurring sound varying in magnitude, tone and meaning. That’s why loud or interfering noises strain our ears, make us irritable and create environments that would otherwise be pleasant. Soundproof Cow’s noise-canceling studio foam is the perfect solution to many noise problems existing in industrial facilities and around construction sites, hospitals and other areas where noise presents health and well-being issues. Recording studio engineers are thrilled by the superior sound absorbing qualities provided by Polyester Film faced soundproof studio foam. Polyester Film faced foam soundproofing panels are flat on both sides and have a UL94HF1 fire rating to accommodate rigorous fire codes. In addition, this popular material is also available with pressure-sensitive adhesive which allows for easy peal and stick installation. Our customers love Polyester Film faced acoustic foam because it’s so effective at reducing internal reverberations. It also has radiant thermal resistance and resists abrasion. By absorbing sounds generated at a wide range of frequencies, this superior type of foam soundproofing not only helps prevent noise-induced hearing loss but also makes any environments more pleasant and much less stressful. Installation is easy with the Pressure Sensitive Adhesive Option. Simply peel, stick, and rub. It’s fiber-free, which makes it especially useful for quieting computer, medical and other “clean” room equipment. 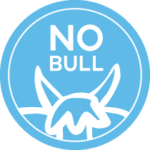 If you want to talk to some interesting people who take pride in eliminating unwanted noise call Soundproof Cow today at 866-949-9269.